Michael: I cannot help but think of this quote when I read Marvel Two-in-One 11. Overall the Superman/Lex Luthor dynamic isn’t a perfect analogue for that of Mr. Fantastic/Dr. Doom, except maybe in this instance. It’s the nature of causality: would Victor Von Doom be a good man if not for Reed Richards? Chip Zdarsky explores that idea in issue 11. In the wake of Secret Wars The Fantastic Four was left in a state of disarray. Readers were dismayed at their absence, but can you imagine what the members of Marvel’s first family felt? Reed Richards and Sue Storm took Franklin and Val took off on a multiverse road trip and left Ben Grimm and Johnny Storm behind. And Ben ain’t happy. We have all had that friend we aspire to be and/or envy — the bigger brother or sister we perceive as smarter, faster, or just better in every way etc. For better or worse, Reed is that older brother figure for Ben — he’s irritated when Reed patronizes him and he is deeply hurt when he leaves him behind. Reed dismisses Ben’s claims that he abandoned them because he thought Ben would’ve been bored — but no one likes being excluded. Ben rightfully calls him out by saying that he didn’t even ask for Ben’s input on the matter. More to the point, Ben and Johnny believed that the Richards family were all dead, not on a cosmic vacation. As far as I’m concerned Reed doesn’t offer up a good excuse/explanation for not letting Johnny and Ben know that he wasn’t dead — they weren’t in any real danger after all. I believe that with genius — academic, artistic or otherwise — comes with a certain level of ego. 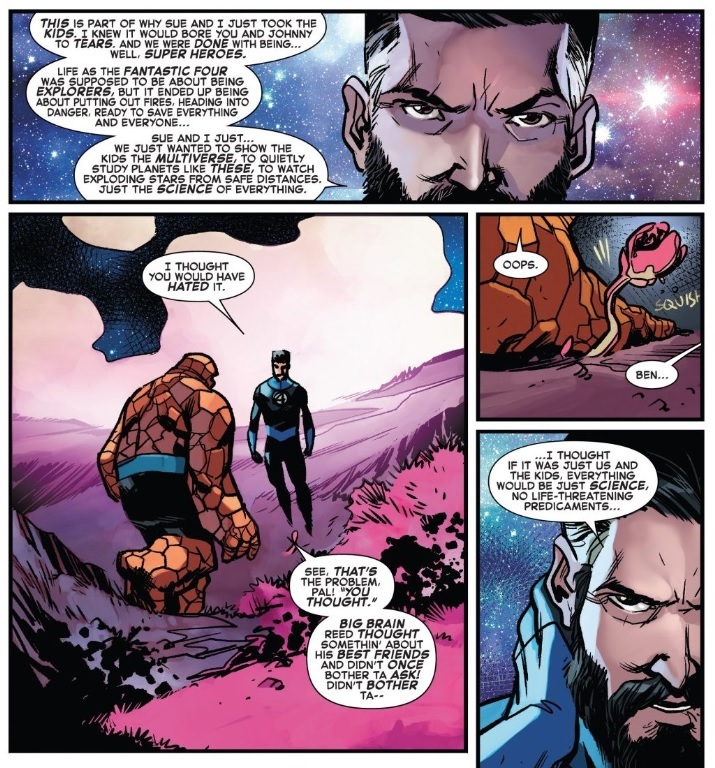 And when you name your team The Fantastic Four and yourself Mr. Fantastic…you most certainly have an ego. In Marvel Two-in-One 11 however, Reed’s ego is on full display — the fact that he thought he could leave his brothers alone without even a text notwithstanding. Reed explains to Ben that another major reason that he disappeared was because of Dr. Doom — a different Dr. Doom, that is. Reed gives his take on the nature of genius, with Victor Von Doom as the subject. He opines that with genius comes a certain curiosity, understanding and general hope about the nature of the universe. Reed is telling Ben this in regards to his multiversal pal Victor but he could just as well be talking about himself. 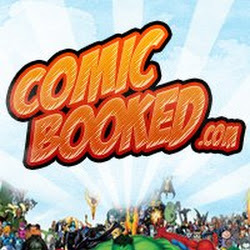 Reed believes that deep down Victor Von Doom — any Victor Von Doom — has the capacity for good because his intellect must allow him to realize that fact. What Reed is really saying is that he, with his big stretchy brain, believes is that deep down Doom is too smart to be bad. Reed befriended the Dr. Doom of Universe P-1837 because it was a universe whose Reed Richards was dead, allowing Victor Von Doom to move past any jealousy or rivalry and be a force for good. To recognize that his rivalry with Doom is unhealthy — probably for them both — shows a significant amount of self-awareness, but at the same time the way that he considers himself an integral part of that equation feels a little conceited. To be clear I think that Reed is probably right, just as Superman hopes Lex Luthor is being truthful about helping the world once Supes is gone. But there’s a certain level of humility and objectivity involved that I don’t know if Reed Richards is capable of. Drew, what’s your take on Reed’s big brain & ego? Do you sympathize with him a little more than I did? 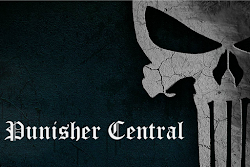 What did you think of the Thinker apprehension? Would you have preferred that that was omitted so we could have more Reed/Ben time? Drew: That last thought is an intriguing one. You’re absolutely right that the Thinker isn’t relevant to the events or emotional arc of the issue — it feels very much like the perfunctory tying up of an old story thread — but the more I thought about it, the more his presence serves the themes of this issue. The Thinker represents the emotional baggage of Reed’s absence, effectively becoming a chore they wouldn’t have to deal with now if Reed had simply been present when Ben and Johnny were initially confronting him. But by muzzling him (as Zdarsky calls attention to twice in the issue), he represents a problem that Reed and Ben are simply ignoring. And as much as this issue is about Ben’s sense of betrayal at his closest friends basically faking the deaths of their entire family, Reed’s explanation doesn’t really address those emotional truths. Reed frames his reasons as both wants (to take his kids on scientific explorations without the kinds of adventures the Fantastic Four inevitably wind up in) and needs (to see if Doctor Doom would become a hero in Reed’s absence), but they’re all Reed’s wants and needs. He wasn’t concerned with Ben’s feelings when he made those decisions, and he doesn’t seem particularly concerned with them now, as he’s explaining himself. Like, “I wanted to take my family on a trip without you,” is a reasonable enough desire, and I’m sure Ben would have understood if Reed had said as much (though hopefully with more tact than my bad summary of his intentions). But because Ben wasn’t given the opportunity to be okay with it, or to even know what “it” was, he was left fearing that his best friends in the world had died somewhere out in the multiverse. Reed hadn’t just ghosted his best friend — he let him think he was dead. That’s beyond emotionally insensitive, and Ben would have every right to feel betrayed. But it’s actually significantly worse than that. It’s not just that Reed didn’t care about Ben’s feelings, it’s that he prioritized his little experiment with Doom’s soul over his friendship with Ben. In a very real way, Reed was more concerned over the fate of his worst enemy than his best friend, so it’s easy for Ben to feel taken for granted here. 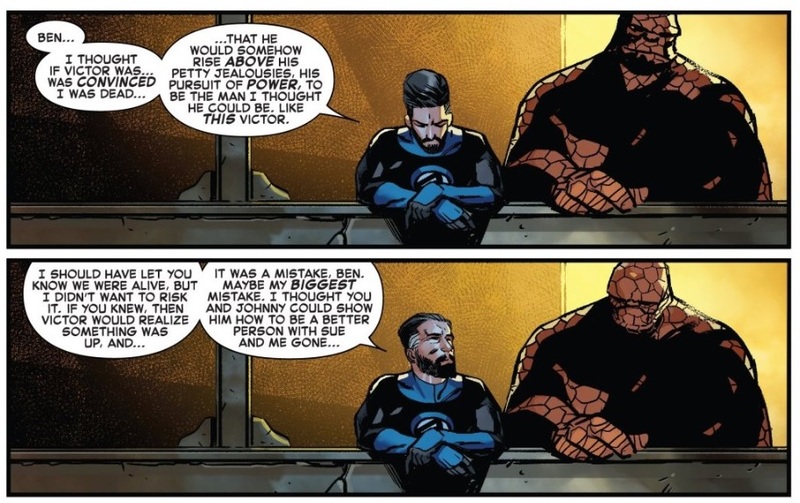 Compound that with the fact that Reed’s explanation has him revealing that he’s also best buddies with a different Doom, and Ben has every reason to feel left out. That’s clever character positioning from Zdarsky, wringing the maximum amount of drama from these two characters’ different attitudes and emotional sensitivities. But I also absolutely love the way artist Ramón K. Perez stages this scene. Reed and Vic are having an intimate moment on one side of the panel while Ben looks on from the other, separated by glass in his own little world. It’s heartbreaking stuff. Even better: the Thinker — that symbol for the problem Ben and Reed are ignoring — is actually in there with Ben, though we don’t see him until Reed shows up on the next page. That’s clever stuff, disguised as a meaningless errand to send these two on as they work out their issues. That the Thinker’s presence is more complicated than that is just a microcosm of this issue, where everything is more complicated than it seems on the surface. This issue really suffered by the need to explain things best lest subtextual. 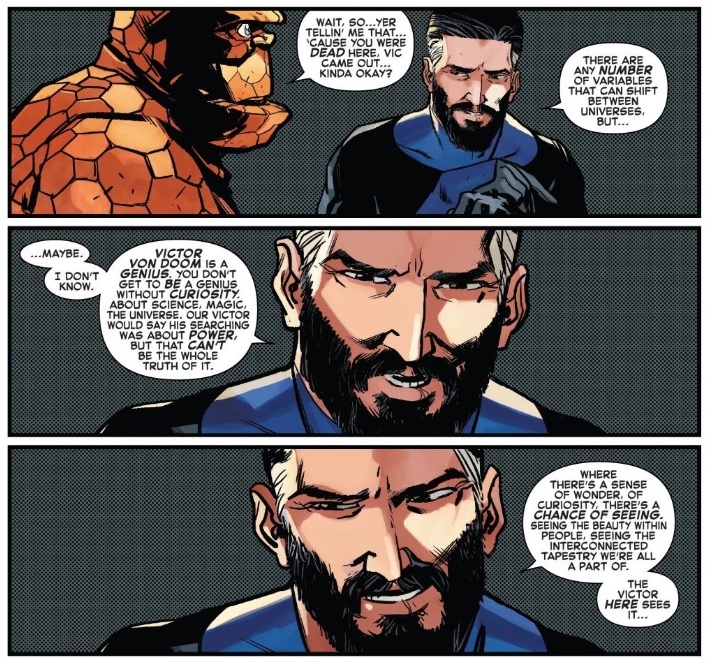 I guess this is what happens when we have to have Reed and Sue etc return, but the subtext implied in Secret Wars is a more satisfying answer than any attempt to make it a character choice, which just leads Reed giving out of character responses. Ultimately, Secret Wars had the best answer. It was symbollic and metaphorical, but it was the best answer. Reed ascended to godhood. You can pick apart the logic of who got to be part of this ‘godhood’, but in truth that’s the reason. Where Reed was, no one else could reach. Now, we can discuss all the reasons why Secret Wars ended that way, including the meta reason that, once again, the Fantastic Four starts the Marvel Universe. But the subtext was all that was needed to know. Reed, Sue and the Future Foundation had moved beyond the Marvel Universe, and others couldn’t follow. That was what winning meant in Secret Wars. Any attempt to make it more than that, make it character based, just falls into the trap that there can be no character reason for this that actually works. Endings like that aren’t supposed to be taken super literally.